December 14, 2017, 8:49 PM · One difference between being a professional soloist and being an occasional one, is that the former’s life is structured entirely around practice, rehearsal and performance; whereas the occasional soloist’s life can be full to the brim with other things which they can’t just stop when the concert opportunities arrive, in order to do nothing but practice. It all has to be done on top of all the other commitments. Therefore if you don’t have endless time in which to practice, and if you don’t always have your best energy to give to it, you have to be constantly on the lookout for ways to save time, and to make more progress in less time. Every minute of practice must be productive. Part of saving time is to find ways of fixing multiple problems with a single solution. It was during my preparation for a performance of the Tchaikovsky Violin Concerto, twenty years ago, that I had a ‘eureka’ moment that I reflect on to this day. The concert was with the Philharmonia Orchestra, conducted by Sir Charles Groves, and was part of the series in the grounds of Kenwood House, within Hampstead Heath, London. It was a similar venue to the Hollywood Bowl in Los Angeles, though smaller. There was the same sort of enclosure over the stage and audiences of up to 10,000 sitting in the open air, the sound amplified through loudspeakers. What was I doing all that time? Primarily I was working on making sure that every note was clean, every note was in tune, and every note was musically rhythmically in time. I wanted to make sure that no note was "dropping out" – ie, in a fast passage there were no notes that were either shorter or softer than the surrounding notes. And I was working on all the shifts to make sure they were entirely reliable. What about the music? Well of course what I wanted was to give a meaningful musical performance. It is a piece of ballet music, full of every possible emotion and excitement – not just an empty technical display. But a favourite quote I reference constantly is from the great Russian violinist Nathan Milstein who, when asked what he thought about when he was playing, said: "I don’t think about anything, really. I’m just trying not to spoil the music!" Exactly! So what spoils the music? Certainly mistakes of intonation, monotony or lack of expression in the sound (or vibrato), or lack of true rhythm and expressive musical rhythm; and if there is one thing that can mess up all of these, it is shifting. I was working on improving the evenness of the descending and ascending arpeggios. The shifts (marked +) caused slight disturbances in the tone and the rhythm. I had already practiced in dotted rhythms, and with separate bows; I had played only one note, then two notes, then three, starting first from the bottom and then from the top; played with the metronome, starting slowly and speeding up; and various other things. Yet often when I came to this passage, even if I managed to play it "well" it still did not necessarily feel easy. Then it hit me. I was shifting too late. Or I wasn’t shifting early enough. "One of the commonest faults in shifting is that of shortening the note preceding the move. The reason behind this fault is always a psychological one. The player worries about the shift to the point that he loses rhythmic control and nervously anticipates the correct moment for the move. This gives a feeling of insecurity and great unevenness to the passage. Conscious attention to the rhythmic value and sound of the note preceding the shift is imperative until correct habits are formed." But if you do not steal time from the note before the shift, it must mean that you begin to shift after you have played the full value of that note (the note before the shift). But now you are already meant to be playing the note AFTER the shift. Then where is the time for the shift to come from? If you are going to walk somewhere and want to arrive at 2:00, and it is going to take half an hour to get there, you know you must leave at 1:30. Or if instead you go by taxi, perhaps you can leave at 1:50. And if you could go by helicopter, you could probably leave at 1:59. But it’s no good staying at home until 2:00 and then setting out. You have to leave before you want to arrive! So you cannot stay "at home" on the note before the shift for very long at all if you are going to shift slowly. You can stay on it for longer and longer so long as you shift faster and faster. But the time for the shift must be stolen from the note before the shift! I realised that logically, Galamian’s edict could not stand. No matter how early you shift, the group of notes sounds even. It is all about the rhythm of the front of the note. If the front of the note before the shift is in time, and the front of the note after the shift is in time, the notes sound regular even if you actually play only a fraction of the note-value before the shift. Just so long as the beginning of that note is in time. After my discovery, suddenly every shift became a complete "non-issue." I felt heady with elation because here was not only the answer to this passage, but to all passages! It was not that I had never shifted well before, I hasten to add! It was just that I had not realised what I had been correcting, in the past, by practicing shifts until they were reliable. With regard to the Galamian quote, the issue reminds me of another one, this time to do with the bow arm. I once remarked to the Russian teacher Zachar Bron that it was odd that Carl Flesch never mentioned the "in" and "out" that Galamian describes – the upper arm pushing forward (out) at the end of the down-bow, moving back (in) at the beginning of the up-bow. Flesch talks only about opening and closing at the elbow, which if taken literally makes the bow move out diagonally from the bridge. Bron suggested that it would probably not have been that Flesch did not understand it, but that he thought he did not need to say it. Looking at the same levers in the left arm, Bron pointed out, nobody says that when you shift upwards, apparently just with the forearm, the left upper arm moves in towards the body at the same time – without which the scroll of the violin would jerk upwards. Nobody mentions it because the movement is automatic. Similarly, he said, it probably never occurred to Carl Flesch that anybody would try to open and close the arm at the elbow without the in and out movement of the upper arm. Along the same lines, perhaps it simply never occurred to Galamian that anyone could take his words absolutely literally, since of course there has to be a fraction of the note given to the journey. That may be so, but I remember clearly the day when a fellow student in my class at the Guildhall explained "in" and "out" to me, and the feeling of revelation I had – as well as annoyance that the bow arm I had been taught for years, by a succession of different teachers, had turned out to be missing something vital. And it is the same with this question of the length of the note before the shift. What has prompted this blog is that recently, as a major part of my preparation for some concerts, I have finally gotten around to practicing an entire key of the Carl Flesch Scale System every day, after putting this off for about thirty years. In my defence I have always maintained that the Flesch is something one graduates to, just as you do not begin with Paganini Caprices. Over about two months I went through all 24 keys twice. It is many years since I have played Flesch scales, and I have inevitably been filled with memories of trying to play the same scales as a student. How horribly difficult they were! Particularly the double stops. But even in the single-stop sections, every shift caused a bump that had to be practiced before it was smooth and even. But now, every time I play a shift that is not "perfect" – either the timing or the tuning, or if in any way it does not feel easy and secure – the answer always lies in beginning the shift sooner. And throughout this entire period of scale-work, every time I have applied this super-simple solution, and a "difficulty" has instantly disappeared, the idea of "shouting it from the rooftops" in a V.com blog has come back into my mind. But what about less-developed players, for whom the timing of the shift is only one factor that needs to be adjusted, and which won’t help if meanwhile they are gripping the neck or over-pressing the strings, and doing all the other things which we mustn’t do? Of course the other things need to be refined as well, but my point is that many of the tensions and apparent "other" difficulties of shifting actually stem from not shortening the note before the shift. When a shift is made too late, each one becomes a sort of emergency situation. You know you are already late before you have yet set out, which can easily cause an unconscious, momentary tensing of the hand and left arm, making each shift feel tight or heavy. Instead, shifting early immediately produces a feeling of great ease in the hand. The sense of having "plenty of time to get there" makes the hand relax and soften, and then the shift works lightly and easily. Just shift earlier, and you may be amazed at how much the "stress" of violin playing diminishes all round! Why didn’t anyone tell me this before, I lament! It would have saved me so much time! December 15, 2017 at 08:09 AM · Very timely advice Simon, as I am having a problem with a down shift. I look forward to using this technique. I have been feeling like the white rabbit in Alice: “I’m late, I’m late”. December 15, 2017 at 09:19 AM · Thanks so much Simon for the logical analysis and lucid writing you bring to us in your books and on this website! 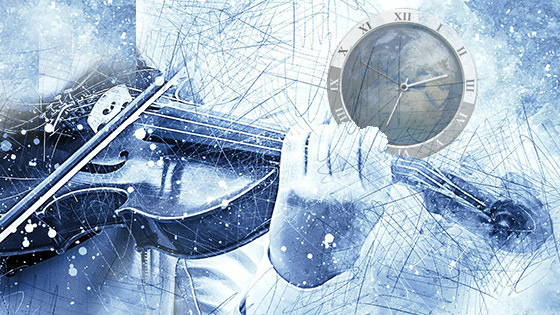 The way you demystify and explain violin technique has a lasting impact. A small comment on the diagram for shifting early enough. In the shift down from D to A, you split up the D in an initial 32nd-note part and the remaining double-dotted 8th-note part. Shouldn't that be the reverse? I.e., we play the initial double-dotted 8th-note part of the D, then use the final 32nd-note part of the D to shift down to the A. Likewise for the second shift in that second diagram. December 15, 2017 at 11:19 AM · Thanks, Jean. It is correct in that it is what I meant to show. It is very difficult to notate, though. What I have tried to illustrate is that if the very beginning of the note is at the right moment, even if all the rest of the note is given to the shift, the notes still sound even. Actually what I have written is not even an exaggeration, given the speed of the passage. In reality the notes before the shift here really are played for only a fraction of their value. I think if the passage really was in quarters and played slowly, what you are suggesting would be how it would be played. Come to think of it, your comment has just made me realise that the principle "the faster the passage, the faster the shift", is incomplete. Instead, it should be: "The faster the passage, the faster and the SOONER the shift". Why is that second bit never mentioned?! December 15, 2017 at 12:30 PM · That's the problem with old "chestnuts of wisdom." When you can't ask Galamian what the hell he meant, then you have to decide for yourself, and you might decide he was wrong. Of course we amateurs are not allowed to decide that Galamian was wrong. That's why we need modern pedagogues with sterling reputations -- like Simon Fischer. I'm an amateur, what you would describe as an "intermediate" player, and I've been working on the Kreisler arrangement of Mozart's Haffner Rondo. Right in the first couple of bars there's a shift, from G(2) to A(1)on the E string. Don't laugh; I realize that's not exactly a hard shift. And it's not even slurred, so there really shouldn't be a timing issue. But it was nagging me, especially coordinating it with my bowing. I had my own "eureka moment" when I realized that I was beginning the shifting process - even if only mentally - before I was even playing the previous note! I came up with my own "chestnut" which is to just concentrate not on the shift but on the note before the shift, to make sure it sounds clearly and in tune. Basically to trust myself to nail the shift. And with the other usual practice tools, it's much better now. This approach has helped all my shifts. And where I was feeling shiftless before I now feel shifty. December 15, 2017 at 03:39 PM · Thank you for this thought-full & thought-provoking post. It will help my work on the 1st Peterson-Berger sonata become more fluid, and it needs that. December 15, 2017 at 03:53 PM · About the reference. In fact I heard this from Emanuel Hurwitz, who was a personal friend of Milstein. I had told Mannie that when I was a student, I asked the Bulgarian violinist Vanya Milanova what she thought about when she was playing. She was (and remains) one of the brightest stars in my violinistic firmament. I wanted to know what it was like to be a player like her. Her answer - "When the music is happy, I am happy; when the music is sad, I am sad!" - remains another of my most favorite reference points. In reply, Mannie told me that he had asked Milstein exactly the same question, and what I have quoted here was Milstein's reply. But it wasn't about the Bach specifically, so it would seem it was a standard answer of his. December 15, 2017 at 06:36 PM · Thanks for all you do, Mr. Fischer. Please write a book on the Paganini Caprices! December 15, 2017 at 09:39 PM · As others have said, thank you Simon, especially for the clarity you bring so eloquently. The videos are just there to supplement books (like Simon's!) and live teaching. December 16, 2017 at 11:30 AM · Quite an analysis, but I’m not sure I understand it.?? December 16, 2017 at 02:42 PM · My teacher doesn't like the duller sound of the passage when you shift on the D and I have to agree with him, I want it to be as bright as possible. And the E is the more responsive string so I'm more comfortable shifting there. I sure would like to be able to play that one like Heifetz-in-his-70s. I love the way he plays it. My teacher will not let me get away with that many slides. And I see he eases himself back into his sautille after the first cadenza (3:05). His poor pianist cannot keep up. Szeryng's video is about half that speed LOL. December 17, 2017 at 10:52 PM · This is really interesting. I'm just pushing intermediate level and hate shifting. But when I'm playing folk music my my shifts are almost always on pitch and in time. I rarely ever stress about then. When I play classical, not so much. This isn't about technical difficulty as they can be equally difficult, especially when it comes to eastern european music (though there are less of them in fiddle music and usually only on the e string). But I'm playing classical mostly from the music and folk from within the 'groove' (even if I'm using music). So I don't spend all those extra notes getting ready for it (you're not alone in that, Paul) and don't end up off the rhythm - all stresses I add when practicing classical music. So this part about moving early makes sense - I'm conceptualising the music in a different way and the shifts are relatively effortless. December 18, 2017 at 01:43 AM · Susanna Klein: not to derail this topic, but I want to let you know how much I liked the video you mentioned in your comment. Your point very nicely complements Simon Fischer's thoughts on shifting. Bravo to violinist.com for allowing us to hear from great teachers! December 19, 2017 at 01:58 PM · Thanks, Karen! December 20, 2017 at 02:02 AM · Love this--thanks, Mr. Fischer! It's great to know before I even get into much shifting. Every note on its beat. Even rhythm, too, just that one note has less duration before the move. Wonderful! This is similar to when-do-you-turn-the-page (I'm talking playing piano w/ both hands here). Do you wait till the last second, playing every note and trying to turn the page fast enough to see the next passage? Doesn't guarantee the page will indeed get turned fast enough to prevent an awkward pause or mistake, or both. I have begun to skip the notes for one hand or the other to turn the page with enough care to be ready for all the notes on the following page, and the omitted notes are hardly noticeable. I have far less anxiety and missed notes on the following page. Your ideas are so encouraging. Thanks again, Mr. Fischer.